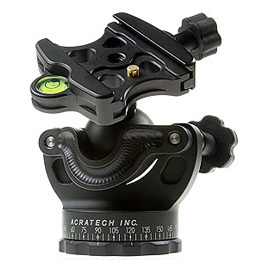 I’ve been an admirer of Acratech gear since purchasing my Ultimate II Ballhead in 2006. They are certainly different from the norm yet have a very good reputation. They are extremely light weight too, seem well made, robust, and can support quite heavy loads. I’ve owned a GV2 ballhead for over 3 years now which has become my principal ballhead, so I thought it’s high time I write a review and see if it’s lived up to that impressive reputation. Acratech ballheads certainly don’t look like traditional ballheads but accomplish much same task albeit in a slightly different manner. They look rather skeletal in design, with almost all of the ball exposed rather than the traditional totally enclosed design that most of us are used to. This may be off-putting to some as you’d think this would expose the internal workings to dust, sand and the elements, but Acratech advise that a simple rub down with a dampened cloth or some isopropyl alcohol is all that’s required (they warn never to use oil or WD-40). Even with my Ultimate-II ballhead, in reality, dirt has never posed a problem, even when dumped in sand on the beach. I’ve just rinsed off the head with water and wiped it down with a damp cloth and it’s been fine. Remarkably the dirt just never seems to gets inside the workings.